VANCOUVER, BC – Taking advantage of the fact that today is IPA Day, Vancouver’s Parallel 49 Brewing has announced the release of a West Coast style IPA as a new addition to its core brand line-up. Filthy Dirty IPA – so named because it’s “full of filthy amounts of fruity & tropical hop character” – is a 7.2% abv and 75 IBU ale that’s been brewed with Pale, Crystal and Carapils malts, and Chinook, Centennial, Simcoe, Citra and Anthem hops. 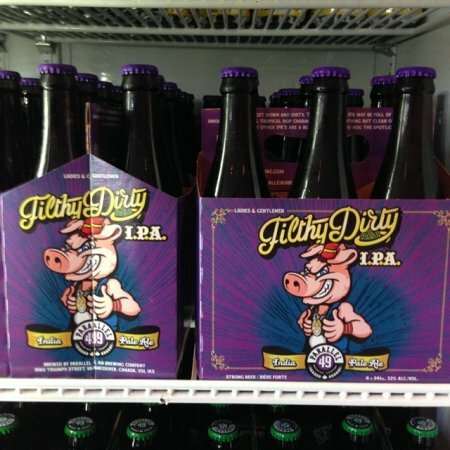 Filthy Dirty IPA is available at the Parallel 49 retail store, and is rolling out now to select private liquor stores in British Columbia. An official launch party will be taking place next Thursday August 14th at The Cobalt (917 Main St., Vancouver), featuring a Parallel 49 tap takeover, $5 beers, and live music by Skinny Kids and Sh-Shakes.